History of Present Illness: The patient is employed at a local lumbar yard. He was cutting a large piece of old plywood with a circular saw when the blade hit one of several staples imbedded within the wood. Though he claims he was wearing a face shield, he felt something go into his left eye. The patient was seen by an outside ophthalmologist immediately after the injury and sent promptly to the University of Iowa Department of Ophthalmology for evaluation. Past Ocular History: No prior ocular condition, injury, or surgery. OS -- Full thickness wound in the superonasal cornea was Seidel negative. The anterior chamber was well-formed with only a few cells per high-powered field. A rent in the anterior lens capsule was seen from 9 o'clock to 12 o'clock. Lying within the substance of the still-clear lens was a thin, metallic foreign body (see Figure 1). Dilated fundus exam (DFE): OD -- Normal; OS -- Fair view, with no evidence of hemorrhage and no foreign body visualized in the posterior pole. Figure 1: Intralenticular foreign body, OS. There is a self-sealing corneal wound at 9 o'clock and an associated iris defect that is now barely visible in the dilated iris. A rent in the anterior capsule is evident (white arrows). Course: The patient had an open globe with a self-sealing, Seidel negative corneal wound. There was an intralenticular foreign body, the superior and posterior extent of which was uncertain. Though the lens remained relatively clear, vision was reduced significantly. We arranged for surgical removal of the intralenticular foreign body (ILFB) – (see VIDEO). In preparation for surgery, ocular echography was carefully performed. This indicated that there was a highly echogenic foreign body at or just posterior to the ciliary body at about 9:30 o'clock. With concern for a possible second foreign body within the vitreous space (or posterior extension of this staple), the vitreoretinal surgery team was notified of the pending surgery. They agreed to stand by in case they were needed during the surgery. VIDEO: This still image from the surgical video shows the rare-earth magnet adherent to the staple, which is being lifted out of the lens. A capsulorhexis incorporating the traumatic tear (black arrowheads) is visualized. The entrance wound for the staple has been closed with a single corneal suture (white arrow). Intraoperatively, the capsule was stained as described in the literature (Newsom and Oetting, 2000 and Baykara, 2002) to allow improved visualization. Care was taken not to increase the anterior pressure and risk posterior loss of lens material or foreign body. A curvalinear capsulorhexis was accomplished that incorporated the existing rent in the anterior capsule. A small-gauge, permanent, rare-earth intraocular magnet combined with an intraocular probe was used to retrieve the ILFB from the lens. Careful manipulation and delivery of the ILFB from the eye revealed the true size of the staple as over 12 mm in length with gouges in the metal still visible from the saw blade that created this projectile. A bend halfway down the staple had placed the other end of the staple superonasally and had created the confounding echo in that area on ultrasound. We decided to proceed with primary lens extraction. With the integrity of the posterior capsule in question, no hydrodissection was used. A low bottle height and gentle technique were employed. The lens was removed in its entirety using the irrigation/aspiration (I/A) tip, with special caution in the area of possible capsule or zonular injury. Careful examination by the authors and the retina team as well as post-operative fine-cut CT scan confirmed no residual intraocular foreign body. Six weeks after primary ILFB and lens extraction, a secondary intraocular lens was implanted. Post-operative day #1, the patient's best-corrected visual acuity was 20/25+1. He is expected to do very well. Not all ILFBs require surgical removal. There are case reports of no intervention without sequelae for many decades (Cazabon, 2002), including the first formal description of an ILFB in the literature (Archer, 1897). Small, peripheral ILFBs without central lenticular opacification may often be observed. However, with retention of any possible iron-containing ILFB there is always the risk of siderosis (Sneed and Weingeist, 1990). Additionally, suspected high-percentage (esp. >85%) copper should not be left in the eye due the devastating effects of chalcosis. Vegetable matter should not be left in the eye due to the increased inflammatory response and risk of endophthalmitis (both bacterial and fungal) that can be associated with this type of injury. When the decision has been made to remove the foreign body, the surgeon should seek to evaluate the extent of anatomic disruption caused by the ILFB in preparation for surgery. Some combination of pre-operative imaging will allow evaluation of the condition of the posterior capsule and the possibility of posterior foreign body or injury. Plain film or CT images with fine cuts may be helpful in grossly localizing a suspected metallic foreign body and ruling out a posterior piece thereof. Examination by a skilled echographer (especially with high resolution ultrasound biomicroscopy or UBM) may provide more detailed information about the orbit and posterior capsule. A recent report suggests that the Scheimpflug image obtained with the Pentacam may be helpful (Grewal, 2006). Measurement of axial eye length and keratometry will be helpful in calculating lens power in cases where primary intraocular lens implantation is a possibility. In cases of probable posterior foreign bodies or suspected damage to the posterior capsule with high risk for posterior lens or foreign body dislocation, the advice and possible involvement of a vitreoretinal surgeon would be prudent. Removal of ILFB has been reported with various magnets, intraocular forceps, and pars plana lensectomy (Sneed and Weingeist, 1990). Method of removal should be determined on a case by case basis considering the surgeon's comfort level with the various techniques. After determining to remove the ILFB, the surgeon must still decide whether or not to take the crystalline lens. If the ILFB may be removed without significant disruption to the visual axis of the crystalline lens, this can be a reasonable option (Luo, 2003 and Pieramici, 1996). This option should be seriously considered, especially given that many of these patients are young and would lose their accommodation with lens extraction. The localized lens opacity that results from ILFB removal in an eccentric location may be observed indefinitely. If conservation of lens transparency cannot be maintained, however, the surgeon should plan to remove the lens in the same surgery (as was the case in the patient here presented). Removal of the cataractous lens may be done by any of several techniques. Until the 1970's, intracapsular cataract extraction was the method of choice. Since the latter third of the 20th century, a variety of extracapsular cataract extraction (ECCE) techniques have been reported for removal of the lens in association with an ILFB. In some cases, the entire lenticular nucleus and imbedded ILFB have been expressed en todo (Bishara, 1985). Alternatively, ECCE may be performed after removal of the ILFB. Modern phacoemulsification offers an alternative method for removal of the cataract. Some variations in technique should be considered. The risk of posterior capsule damage would discourage using hydrodissection techniques which could rupture a compromised posterior capsule and complicate the surgery. Lower bottle height and minimal manipulation should be done for the same reasons. 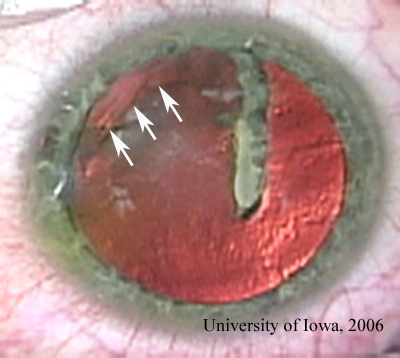 Since most patients with this type of injury are young (the majority are young males), the entire lens may be removed with aspiration techniques (either manual aspiration or automated irrigation/aspiration). Essentially, the surgical approach in the case of an ILFB and questionable posterior capsule is similar to the approach for a posterior polar cataract (Vasavada, 1999). Following removal of the crystalline lens it may be possible to insert an intraocular lens primarily, based on pre-operative calculations. Some would argue against this plan given the increased risk of infection associated with trauma. However, in cases of a relatively clean mechanism of injury, a quiet pre-operative eye, modern peri-operative antibiotics, and an intact posterior capsule, this is not an unreasonable option. Though the literature is, as yet, silent on this point, anecdotally we have had excellent outcome in one such case. In many cases, it may be prudent to implant an intraocular lens (IOL) secondarily, 4-6 weeks after the initial ILFB removal. Depending on the integrity of the capsular bag, the IOL may be placed in the sulcus or the capsular bag may be re-inflated with viscoelastic and the IOL placed "in the bag". Glasses or contact lenses may still be required for optimal visual rehabilitation, especially if there is significant acquired astigmatism either from the traumatic corneal injury or the extraction wound. Of course, correction for the loss of accommodation will be required. Above all, treating cases like these remind the ophthalmologist of his or her duty to play an active role in the prevention of ocular injury. We can inquire about dangerous activities and actively promote the use of protective eye wear for our patients. Other materials include glass, stone, cilia, vegetable matter, etc. Archer TB. Foreign body in the lens for 16 years, lens remaining clear. Lancet. 1987;1:803. Arora R, Sanga L, Kumar M, Taneja M. Intralenticular foreign bodies: Report of eight cases and review of management. Indian J of Ophthalmol 2000;48(2):119-22. Baykara M, Dogru M, Ozcetin H, Erturk H. Primary repair and intraocular lens implantation after perforating eye injury. J Cataract Refract Surg. 2002;28(10):1832-5. Bishara SA, Nesher RG, Zelikovitch A. Extracapsular extraction and lens implantation for cataracts with foreign bodies. Ann Ophthalmol. 1961;66:830-2. Cazabon S, Dabbs TR. Intralenticular metallic foreign body. J Cataract Refract Surg 2002;28(12):2233-4. Dhawahir-Scala FE, Kamal A. Intralenticular foreign body: a D-Day reminder. Clin Experiment Ophthalmol 2005;33(6):659-60. Grewal SP, et al. Role of scheimpflug imaging in traumatic intralenticular foreign body. Am J Ophthalmol. 2006;142(4):675-6. Keeney AH. Intralenticular foreign bodies. Arch Ophthalmol 1971;86:499-501. Kumar A, Kumar V, Dapling RB. Traumatic cataract and intralenticular foreign body. Clin Experiment Ophthalmol 2005;33(6):660-1. Luo Y, Wang Z, Lin X, Hu S. Removal of intralenticular magnetic foreign bodies with intraocular magnet. Yan Ke Xue Bao. 2003;19(3):142-5. Macken PL, Boyd SR, Feldman F. Intralenticular Foreign Bodies: Case Reporst and Surgical Review. Ophthalmic Surg. 1995;26(3):250-2. Narang S, et al. Role of prophylactic intravitreal antibiotics in open globe injuries. Indian J Ophthalmol. 2003;51(1):39-44. Newsom TH, Oetting TA. Indocyanine green staining in traumatic cataract. J Cataract Refract Surg. 2000;26(11):1691-3. Pieramici DJ, Capone A Jr, Rubsamen PE, Roseman RL. Lens preservation after intraocular foreign body injuries. Ophthalmology 1996;103(10):1563-7. Sneed SR, Weingeist TA. Management of siderosis bulbi due to a retained iron-containing intraocular foreign body. Ophthalmoloy. 1990;97:375-9. Vasavada A, Singh R. Phacoemulsification in eyes with posterior polar cataract. J Cataract Refract Surg. 1999;25(2):238-45. Suggested Citation Format: Graff JM, Oetting TA, Kwon YH. Intralenticular Foreign Body : 23-year-old male with staple in the eye. EyeRounds.org. January 31, 2007 ; Available from: http://www.EyeRounds.org/cases/63-Intralenticular-Foreign-Body-Open-Globe.htm.